there are those who say that it comes from gis גיס in Aramaic, which means "side"
Gis as side is familiar from the Aramaic phrases chad gisa חד גיסא - "the one side" and idach gisa אידך גיסא - "the other side". Avshalom Kor (Yofi Shel Ivrit, page 84) agrees with this explanation, and writes that gis is a "relative on the side". None of the modern dictionaries connect gis to gayis גייס - "troop", which is the source of giyus גיוס - "draft". For example, Klein only points out that gayis is related to the Arabic word jaysh - "army". However, Jastrow has a more extensive etymology for gis that connects it to gayis as well. He says that both are from the root גוס, which means "to come in contact, touch, be connected, meet". The Aramaic verb גוס does mean "meet" in Pesachim 110b and Gittin 65b - I couldn't find anyone who disagreed with that. He then goes on to say that gisa גיסא meaning "neighborhood, side" derives from that root (I guess sides are connected to one another), and then connects brother-in-law to side, as we've seen before. He connects gayis as well, by saying that it means "troop", but "especially ravaging troop, invaders, robbers". The connection here seems to be that an invader comes in contact with the area he invades. But there is one thing I don't understand in Jastrow's theory. He also writes that the root גוס is the source of another meaning of גיס - "intimate, familiar". He brings examples from Ketubot 85b and Kiddushin 81a, where the phrase גיס ביה - "familiar with him" is used. It seems clear to me that this is just the Aramaic form of the Hebrew -gas ba גס בה. However, Jastrow says that the Hebrew gas comes from an unrelated root, meaning "to be bold", so gas ba means "he may be become bold towards her" (Ketubot 12a). This etymology of gas isn't too far from Klein, who says that it originally meant "coarse, bulky" and then meant "vulgar, impolite, discourteous". But what caused Jastrow to miss the obvious connection between the Aramaic and the Hebrew? Was it his need to tie in gisa and gayis, and explain the meaning of gis as "meet"? Does anyone have a more charitable explanation? While some of the kinship terms we've looked at so far have changed their meanings over time, we haven't seen a basic term that needed to be "invented". However, in 1943, the Jewish National Fund (KKL) asked the Vaad HaLashon for a Hebrew term that to us might seem obvious - nephew. In the listings in the memorial books of the KKL, it is customary to note the relationship between the dedicators and the dedicatees, as in: So-and-so is recorded by his parents, brother, etc ... 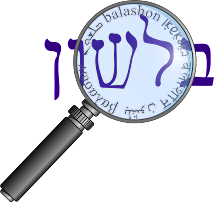 It is not clear to us if the word nin נין means the son of the grandson or granddaughter, which is the popular usage, but is opposed to the opinion of the commentators. Also, as to the new words dodan דודן and achyan אחין - it is questionable whether to accept them, and if we do, what is their feminine form. The question was put to a committee headed by Tur-Sinai. In response, they wrote a dictionary of family terms, which can be found on this site (unfortunately, I can't link directly to it - to access it, click on the link הצגת מלון on the right, and then in the drop down menu choose משפחה). The committee suggests the word nechdan נכדן (not achyan אחין), on the basis of the fact that in our Medieval literature the word neched נכד had that meaning (nephew), and it is still used in the linguistic traditions of some ethnic groups. It is also worth pointing out that the Latin word nepos, from which are derived the words "nephew" and Neffe (German), is used for both meanings: the son of the son (or son of the daughter) and the son of the brother (or son of the sister). By adding a nun at the end (of neched), as was done with dodan דודן (cousin) from dod דוד (uncle), we achieve the necessary distinction needed today. We'll discuss dod and dodan at a later time, but first a couple of points about their note. The word neched appears three times in the Tanach (Bereshit 21:23, Yishayahu 14:22, Iyov 18:19) - each time paired together in a phrase together with nin נין. We've already noted that while in Modern Hebrew nin means "great-grandson", in Biblical Hebrew it appears to mean "son". According to most commentators, neched in Biblical Hebrew does mean grandson. It doesn't appear much in Talmudic Hebrew (Jastrow offers first "offspring", second "grandson" - and only brings one example.) But the Medieval use of neched as nephew that Tur-Sinai mentions can be found in the Rashbam on Bava Batra 108a. c.1297, from O.Fr. neveu (O.N.Fr. nevu) "grandson, descendant," from L. nepotem (nom. nepos) "sister's son, grandson, descendant," in post-Augustan L., "nephew," from PIE *nepot- "grandchild," and in a general sense, "male descendant other than son" (cf. Skt. napat "grandson, descendant," O.Pers. napat- "grandson," O.Lith. nepuotis "grandson," O.E. nefa, Ger. Neffe "nephew," O.Ir. nia, gen. niath "son of a sister"). 1297, from O.Fr. nièce (12c. ), earlier niepce, from L. neptia, from neptis "granddaughter," in L.L. "niece," fem. of nepos "grandson, nephew". Replaced O.E. nift, from P.Gmc. *neftiz, from the same PIE root. Until c.1600, it also could mean "a granddaughter" or any remote female descendant. "favoritism shown to relatives, esp. in appointment to high office," 1662, from Fr. népotisme, from It. nepotismo, from nepote "nephew," from L. nepotem (nom. nepos) "grandson, nephew". Originally, privileges granted to a pope's "nephew" which was a euphemism for his natural son. According to Almagor-Ramon (Rega Shel Ivrit #19), the double meaning of the Latin term nepos influenced the Hebrew usage of neched in the Middle Ages. However, the official suggestion of nechdan ran into trouble early on. In 1948 Avinery wrote (published in Yad Halashon, page 389) that we shouldn't be surprised that there was no word for nephew in Hebrew. Ancient people weren't as careful about family titles as we are today, and even terms like av אב, ach אח and dod דוד didn't always mean father, brother and uncle (respectively). He continues to say that he agrees with the committee's rejection of achyan for nephew, but nechdan has not caught on either - either in speech or in literature. His suggestion? To use the word nin for nephew. On the one hand, he prefers the Biblical shilesh שילש - "one of the third generation" - for great-grandson. On the other hand, he brings a few examples from the 1930s where nin or nina נינה was used for nephew or niece. For example, in 1931, HaAretz referred to Lord Balfour's niece, Blanche Dugdale, as his nina. But this suggestion also didn't stick. The common term used today for nephew is achyan, and achyanit אחיינית is used for niece. It's not clear to me when (or why) achyan gained its popularity. I asked a neighbor of mine, who's in his sixties, if he grew up using the word achyan. He said no, when he was growing up, he'd say ben-ach בן-אח, and that achyan has only been used in the past 30 years or so. We've discussed ach and achot - brother and sister. Now lets look at a word for a subset of siblings - twins. The Hebrew word for twins, teomim תאומים - appears four times in the Tanach: twice in Bereshit (25:24, 38:27) and twice in Shir HaShirim (4:5, 7:4). The singular form - תאום teom - never appears. According to Ben-Yehuda, it never appears in the singular in Talmudic Hebrew either - but that's much harder for me to confirm, since I don't have a complete concordance of Talmudic Hebrew as I do for Biblical Hebrew. Jastrow does mention the singular feminine form - teuma תאומה - but not the singular masculine teom. Ben-Yehuda also notes that it isn't clear from the Biblical usage whether the word only meant two children born at the same time, or if it would be used for triplets or quadruplets as well. התאים - to suit, fit, match. According to some, the Biblical use (Shir HaShirim 4:2, 6:6) meant "to give birth to twins". Jastrow writes that in Talmudic Hebrew "to be twin-like, joined, adjoining." Klein adds that in Medieval Hebrew, this form of the verb was causative, and meant "he fitted, suited, conformed, adapted". In Modern Hebrew it took on the passive form, and began to mean "was fit, was suited, was adapted". The expression matim li מתאים לי means "it suits me" or, better, "it works for me". from Gk. Thomas, of Aramaic origin and said to mean "a twin" (John's gospel refers to Thomas as ho legomenos didymos "called the twin;" cf. Syriac toma "twin," Arabic tau'am "twin"). Before the Conquest, found only as the name of a priest. After 1066, one of the most common given names. Tom like Jack is used to indicate the male of the species. Thus we have "tom Turkey" or "tom cat", the male and tougher variety of those interesting animals. A "tomboy" is a girl who acts like a boy. Continuing in this series, let's look at the Hebrew words for brother and sister - ach אח and achot אחות. (The generic word for "sibling" is achai אחאי). Ach is certainly related to the verb אחה - meaning "to join, to stitch". Despite the fact that the verb only appears in post-Biblical Hebrew, Klein writes that there is debate amongst scholars whether the verb derived from the noun, or the noun derived from the verb. Steinberg expands the root meaning "to join" to other words - ach אח - "fireplace", where people gather around, and achu אחו "reeds" (later "meadow"), which were used to make ropes for binding. However, modern scholarship has determined that both of these words were borrowed from Egyptian. Under the influence of the German and British use of the word "sister" for "nurse," the Hebrew is now using the word achot (sister) also to mean "nurse." Achot is an unusual word. Despite it being a singular noun, it ends in -ot, which is usually the plural suffix of feminine nouns. We found a similar phenomenon in another kinship term: chamot חמות - "mother-in-law". How did this develop? According to this book, the words ach and cham חם, as well as av אב, originally had three letters, not two. The last letter was a vav (in some forms changed to a yud), and can still be seen in the smichut (construct) form - avi- אבי, achi- אחי, chami- חמי (e.g. avicha אביך - "your father", and not אבך, achiv אחיו - "his brother", not אחו) as well as the familiar Abu prefix meaning father in Arabic. According to the author, the original form of ach was אחו (similar to the Akkadian ahu), which became achot אחות in the feminine. The last letter in the masculine form dropped off, but we still have the strange ending in the feminine. Ben Yehuda explains it slightly differently - he says the original form of achot was achat אחאת, which is אחא with the tav added on as the feminine suffix (I assume he's connecting the word to the Aramaic אחא - acha "brother"). He writes that already in ancient times the patach ("a") changed to a cholam ("o"). Each of these may have a different explanation, but it does show us that our initial assumption that -ot at the end of a word means plural is not always correct. The two forms considered above, עֵדוֹת and אָחוֹת, are feminine nouns ending in –ot. This is also the common plural ending for feminine nouns. In Hebrew of the First Temple period, the form אֲחָוֹת / אַחֲוֹת was used as the plural of אָחוֹת. This situation evolved further in the Second Temple period. Since consonantal waw tended to be elided between vowels, the plural form of אָחוֹת resembled the singular form (אֲחָוֹת/אַחֲוֹת > אֲחוֹת), and so dissimilation gave rise to an unambiguous alternative: *אֲחָווֹת > אֳחָיוֹת. The latter took the place of the ancient form in the later books of the Bible – the prose framework of Job and the book of Chronicles (besides an early precursor in Ezek 16:2), and then in RH. The plural of ‘ahot in Hebrew of the First Temple period was ‘ahawot. The written forms that the masoretes, following the pronunciation tradition of their time, vocalized, conceal forms that were sometimes pronounced differently at an earlier stage in the evolution of Hebrew. Thus, the ketiv אחותי in Josh 2:13, which stand for the plural ‘my sisters,’ should have been vocalized as אַחְוֹתַי; while ולאחותיכם in Hosh 2:3 should have been vocalized וּלְאַחְוֹתֵיכֶם. So in ancient Hebrew, sister was achot, but sisters was achvot. To avoid the confusion, a newer pronunciation developed for sisters - achayot.